The oil and gas industry has many facilities where there are large numbers of gaskets on flanges and valves within pipework. Many of these were installed at a time when CAF gaskets were the normal material used for the purpose. Many CAF gaskets are known to still be present, but there has also been significant replacement of CAF gaskets during servicing. 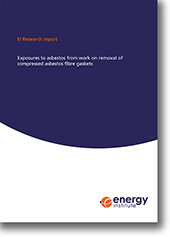 Given the extent of work expected to be required on replacing CAF gaskets, the EI commissioned the Institute of Occupational Medicine (IOM) to undertake this study to assess concentrations that might arise from compliant and non-compliant methods of removal of compressed asbestos fibre (CAF) gaskets and provide information that would assist decisions on future work practices. The first phase was a literature review of published information. The second phase was a series of structured telephone interviews to obtain information on current practice for work on CAF gaskets in the oil and gas industry and to request any unpublished exposure data that might be made available for this report.